Created by Ernest C. Hampton Jr. 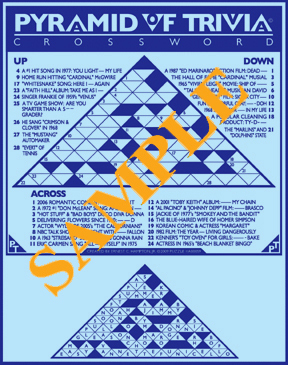 It's the "FUN" crossword puzzle with Up, Down & Across answers about Music, Films, TV and Pop-Culture trivia! Published every Saturday in the "Centre Daily Times" newspaper of State College, PA from 2008-2011. More "PYRAMID" stuff coming soon!